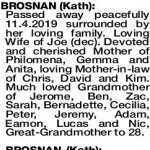 A Funeral Mass for the Late Mrs Kath Brosnan of Berringtons Jolimont, formerly of Wembley/ Mindarie will be celebrated at the Holy Spirit Catholic Church, 2 Keaney Place, CITY BEACH at 1.00pm WEDNESDAY (24.4.19). 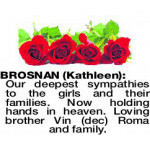 At the conclusion of Mass the Cortege will proceed to PINNAROO Valley Memorial Park, Whitfords Ave, Padbury for Interment in the Tuart Court Section. 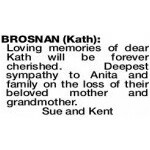 Sympathy to Philomena, her sisters and all the family at this sad time in the loss of Kath, remembered with respect, in thoughts. 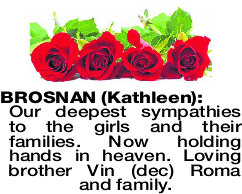 Trish Pillay (nee Lanigan) and family. 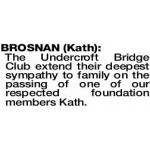 BROSNAN KATH The Undercroft Bridge Club extend their deepest sympathy to family on the passing of one of our respected foundation members Kath.